A collection of my life - With a little Rhode Island flair!! I love trifle. I find it to be one of those desserts that can be super simple, but at the same time creative and delicious. In the past, I've only ever made one other kind of trifle (Death by Chocolate). My sister-in-law makes it all the time, and it's a combination of chocolate cake, chocolate pudding, cool whip, and toffee bits. I have to admit that when I've made this, I've always used whipped cream, which I like better than cool whip, but to each her own, right? Well, I have done research in the past for other trifle recipes, but I never branched out and tried something new. Well shame on me. This past weekend, we celebrated the 4th of July on the 5th of July (mainly because the entire East Coast was plagued by tropical storms and we were rained out on the 4th). We had two different parties to go to, and at the first, I tried a dessert that was absolutely DE-licious!!! Now the dessert that was at the party was not a trifle, it was just all mixed together. But being me, I decided that I would make it in trifle form, and no one was disappointed!! We went to my mom's for dinner on Sunday and I brought this along, and it was an instant hit. Combine that with the easiness factor, and I think it will become a regular summertime dessert! 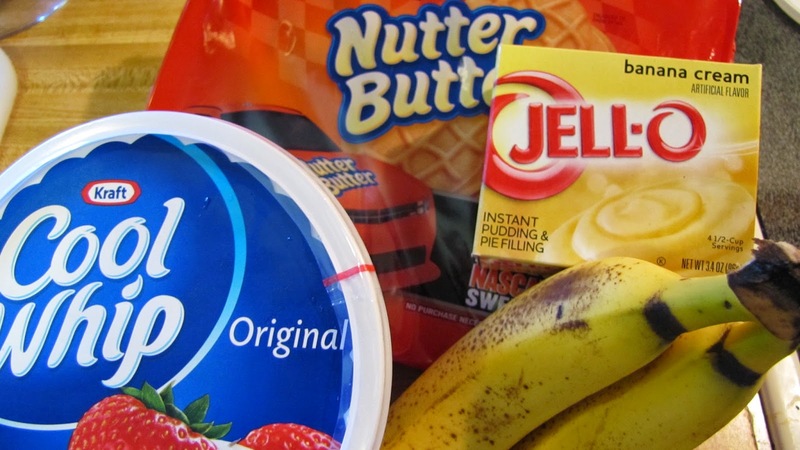 Make the pudding according to package directions and refrigerate for the allotted amount of time. Once completely set, add in the defrosted cool whip. Mix well and set aside. Crumble the Nutter Butter Cookies by putting them all in a large zip-lock bag and giving them a good whack. I use my rolling pin and it's great for getting out any frustrations. If you don't want to do it using this method, just crush the cookies with your hands. Slice the bananas about 1/4" thick. 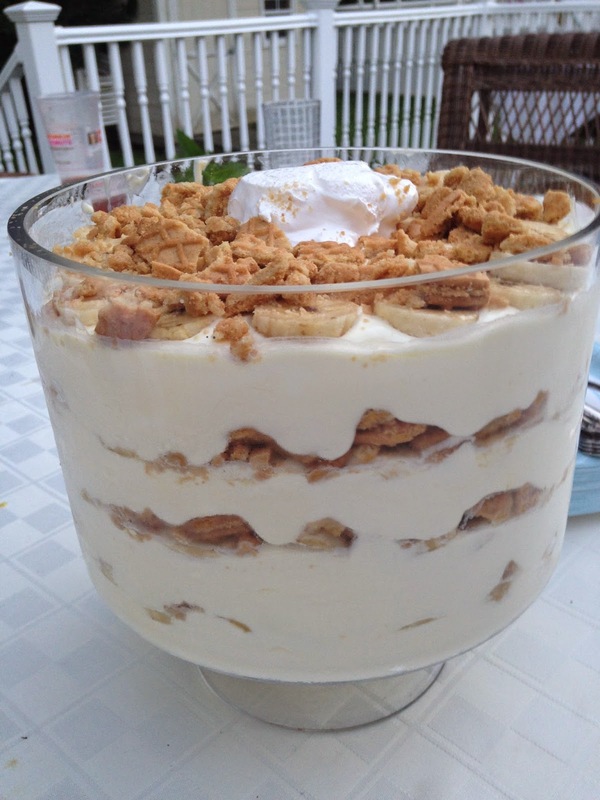 Assemble the trifle by alternating the layers of ingredients: Pudding, Bananas, Nutter Butters, Pudding, etc. Make sure to end the top with bananas and Nutter Butters so that everyone can see what is inside! If so inclined, top the top with a dollop of cool whip. Refrigerate before serving, and enjoy!! July 4th has always been a favorite holiday of mine. We get to celebrate our country, and we get to eat food. As a kid, we always went to Auntie Regina's house and had a party, ate tons of great food, and swam in the pool. It was an all-day event that I always loved. Since Auntie Regina moved to a house that doesn't have a pool, we've all been creating new traditions. For the past few years, Scott and I have always gone down to the beach and visited with his dad's family at their beach house. It's always a fun time. This year, we have two invitations, and we are trying to do both. Because of the impending hurricane (tropical storm? 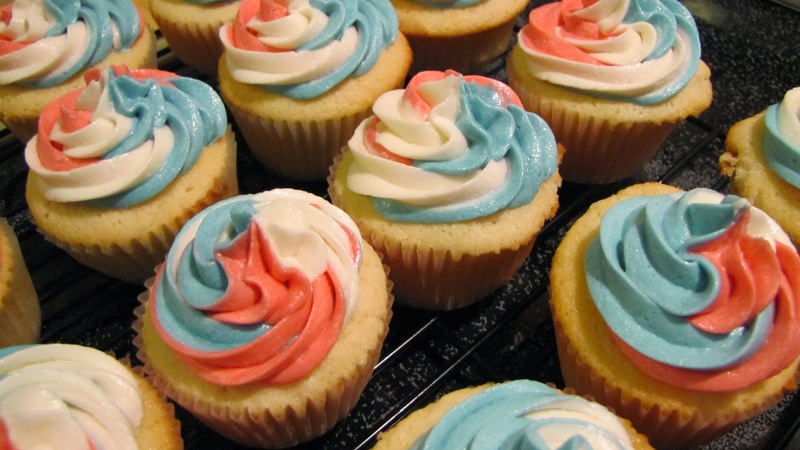 ), all parties have been moved to July 5th, but it gave me a chance to try out a new cupcake recipe! I hope all of our friends and family love my new creation! 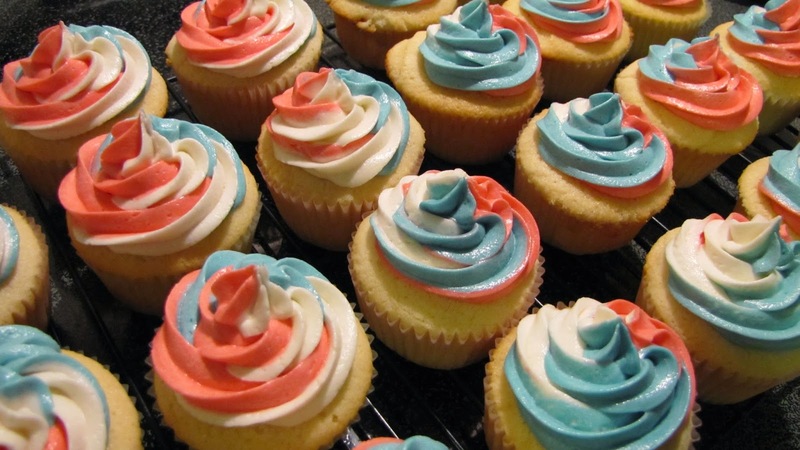 Happy 4th of July Cupcakes! 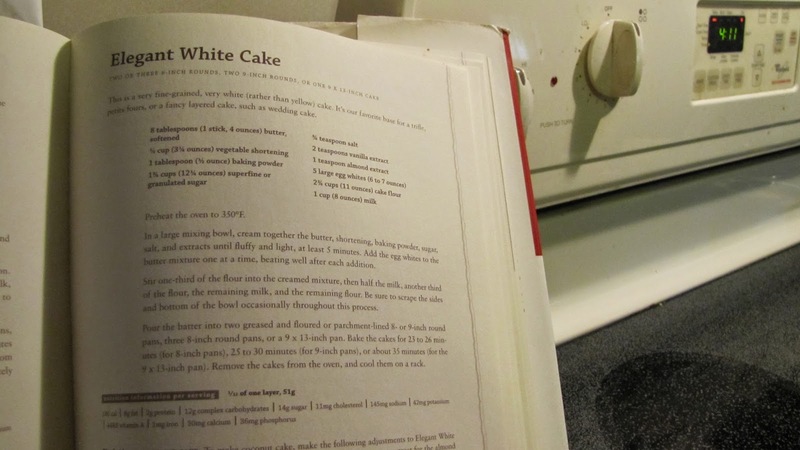 I love using my King Arthur Flour cookbook for baking. I love the recipes and they have never steered me wrong. For today's cupcake, I decided that an easy White Cake recipe would be the best. I had never made this cake before, but I have to tell you: It is awesome! For the frosting, I used my go-to buttercream recipe. Add in the egg whites, one at a time, beating well after each addition. Add in 1/3 of the flour mixture and mix well. Add 1/2 the milk, 1/3 flour, 1/2 milk, 1/3 flour. Mix and scrape the sides and bottom of the bowl after each addition. Scoop the batter into lined cupcake tins. I made 24 cupcakes with this batter, and had just a tiny bit left over (not really enough for even 1 more cupcake). Be very careful not to overflow the tins. They should really only be about 2/3 full of batter. Bake for 20 minutes in a 350* oven that has been preheated. Remove when baked, and cool on a rack. Once cool to the touch, transfer the cupcakes out of the tins and onto the racks to continue cooling. Beat together the butter, shortening, and salt until fluffy. Add in about 3 cups of the confectioners' sugar and beat slowly until well blended. Add about 1/4 cup of the milk and the vanilla and beat again until fluffy. Continue mixing the remaining sugar and milk until they are fully incorporated and the frosting is light and fluffy. Note: I did not use all of the milk. I just kept adding the remaining 1/4 cup a little at a time until it was the desired consistency. 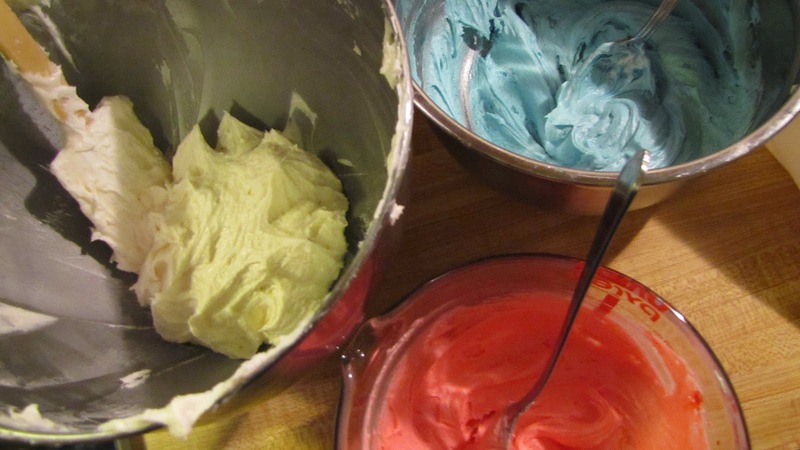 For today's cupcakes, I needed 3 colors of frosting. Split the frosting as evenly as possible into 3 bowls. 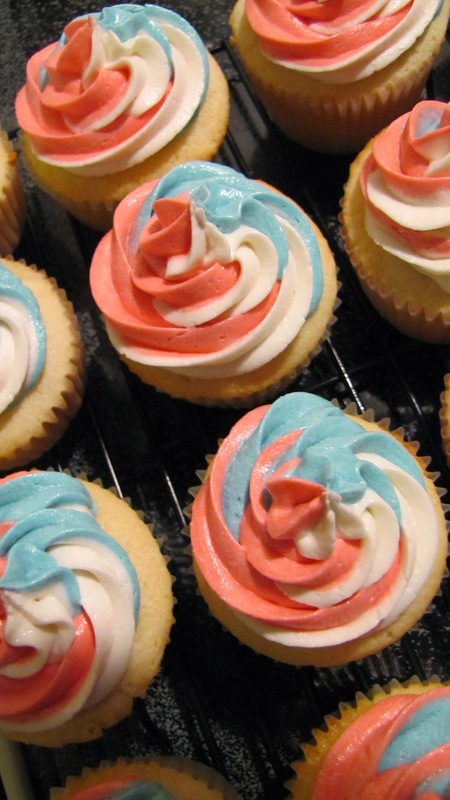 Color the frostings to your choosing (clearly, for the 4th of July, I used red, white, and blue). I used 30 drops each of red and blue food coloring. NOTE: The liquid food coloring, which I used, can make the frosting a lot less stiff. So keep that in mind and add in a little extra confectioners' sugar if necessary). 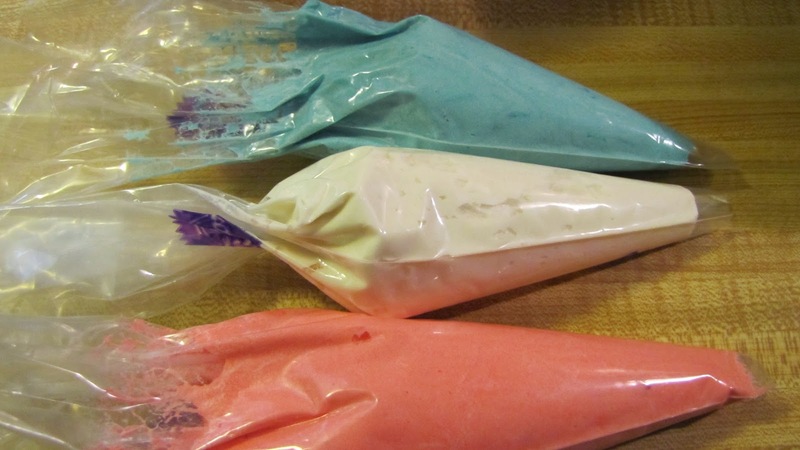 Put the three colors of frosting into 3 separate piping bags (I used the clear disposable kind). Don't fill them up all the way, as they will make a big mess. Snip the tip of the bags, about 1/2". Put the 3 bags together into one large piping bag (I used a 16" piping bag), already fit with a star tip. 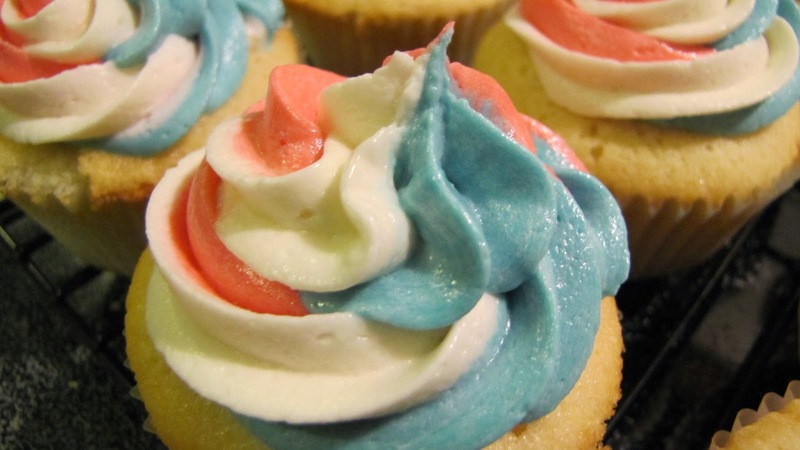 Evenly squeeze the frosting down to the tip of the piping bag and use either paper towel or wax paper to pipe a design and make sure the three colors come out evenly. About halfway through, I did need to refill the bag. If this also happens to you, just fold down the big piping bag, and open the smaller bags to refill with frosting. 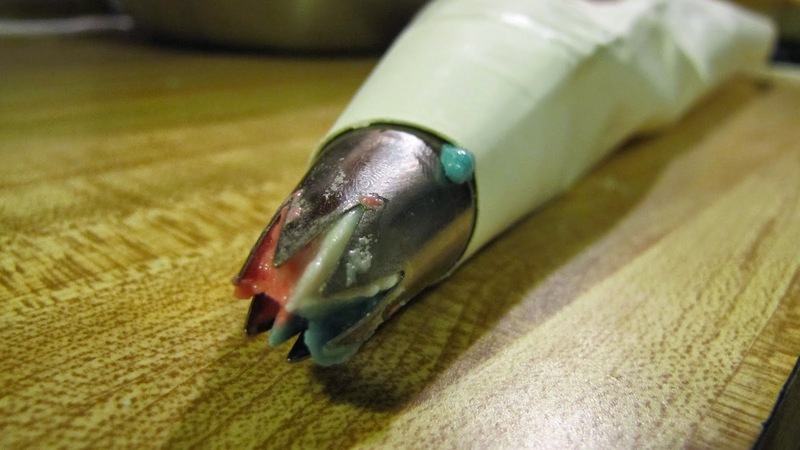 Squeeze down to the tip, and repeat the frosting process!! There are very few people (that I know, at least) who don't like nachos. I LOVE nachos. There is a restaurant near us, Chardonnay's, and while most of their food is quasi-mediocre, they have great sangria and great BBQ Chicken Nachos. I never thought to make the BBQ Chicken nachos myself. However, the other day, I saw a blog post by Baked Bree where she made them, and she cooked the chicken in the SLOW COOKER!!! So naturally, I needed to try them! And they were not only a hit, but they were delicious!! In the slow cooker, I put 3 chicken breasts. The breasts were huge, so I sliced the in half (so I essentially had 6 thinner breasts), and I seasoned the breasts (top and bottom) with seasoning salt. Whatever you have is fine. So -- In the slow cooker, I put the 6 breasts, on low for 4 hours. A lot of water generated from the cooking (you can discard the water when they're done shredding, and you don't need to flip the breasts during the cook time), and when they're done, they absolutely fall apart. Just take tongs and a fork and shred them up! Shred that chicken! After 4 hours on low, the chicken just falls apart! If you're ambitious, you can make your own BBQ Sauce. While I AM ambitious, I was too busy today to make my own, so I fell back on Sweet Baby Rays. I actually used their Sweet & Spicy BBQ Sauce, and it was delicious! All of these, plus some chips, and the chicken, and you've got yourself some absolutely deliciousness! Repeat for as many layers as you want!! I layered my nachos (2 layers) on a baking sheet lined with Aluminum Foil. Once assembled, I stuck the sheet under the broiler for about 5-8 minutes, until everything was heated through and the cheese was melted. Serve with Sour Cream and Guacamole! And Sangria!! One of my favorite "fast food" places to go to is Chipotle. This follows the theory that I might be part-Mexican (not really, but I really do love Tex-Mex food), or it may just be because Chipotle food is quick and easy, and also somewhat healthy. My favorite dish there is the Burrito Bowl, with brown rice, black beans, chicken, fresh tomato salsa, and guacamole. Ideally, I really love it with cheese and sour cream, as well, however I reserve those for special days. I love their burritos, as well, but I find the burrito bowl a less easier to eat, and a lot less messy. Last night, for dinner, I decided that I wanted Chipotle for dinner, at home. We live in Seekonk, MA, and while that is pretty much a central location for just about everything, the closest Chipotles are in Providence (on Thayer St, where you can never get a decent parking spot), Cranston RI (in Garden City, which is an easy enough location, but 25 minutes away and the food will be cold by the time I get home), and Raynham MA (which is right down the street from work, but will once again be cold by the time I get home). Therefore, I decided to put together my own Chipotle at home! In a large frying pan, I sautéed 1 medium chopped onion, 1 red bell pepper, and 1 green bell pepper. I let the vegetables get really soft, but not over-browned. From the market, I cleaned a small All-Natural Rotisserie Chicken of all the white breast meat, and as much of the leg and wing meat as possible. I chopped the meat into cube that only a little bit bigger than the size of the onion and peppers. I added the meat to the onion/pepper mixture, then I added 1 cup of water, and 1 package of low sodium taco seasoning, and mixed until it all came together. A scoop of rice, black beans, chicken and vegetables, tomatoes, and avocado! Delicious, nutritious, and under 600 calories!